Deep brain stimulation (DBS) is under investigation as a new treatment for an increasing number of psychiatric conditions. Candidates for DBS are treatment refractory, severely incapacitated and have a very low quality of life. Patient selection should identify candidates that obtain and retain the greatest benefit. In psychiatric care, it is evident that a psychiatric disorder does not affect patients alone, but has a profound and devastating impact on those around them. These caregivers cannot be neglected in the follow-up process, since the impact of DBS on the psychiatric symptoms of the patient will reflect on the relationships. After surgery, the search for adequate stimulation parameters and the optimization process with fluctuations in symptom severity may be burdensome. Patients may not be abandoned once the DBS procedure is performed. With improvement of symptoms, patients are less stuck in their chronic psychiatric disorder and may need help in the definition of new goals and new purposes in life. Nuttin B, Wu H, Mayberg H, et al. 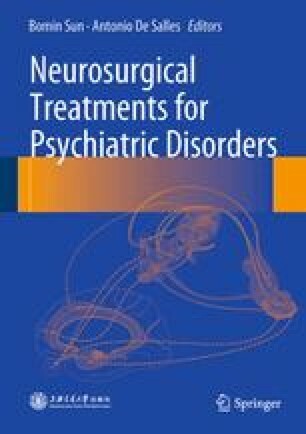 Consensus on guidelines for stereotactic neurosurgery for psychiatric disorders. J Neurol Neurosurg Psychiatry. 2014. doi: 10.1136/jnnp-2013-306580.